future | Wipe it. Clean and Glassy. Weakness. Something that everyone has. No one person is perfect. You should always be strong. The strong survive. It seems to me that people generally believe that they should always be strong and confident often masking our more vulnerable side. We don’t need to always be strong like animals. Because we aren’t animals…..at least, I don’t believe we are. What do we accomplish by masking our fragility anyway? We don’t always have to be strong. I believe that it’s okay to show weakness. And that weakness for me might possibly be my lack of confidence in my future. Usually, I have a tendency to look too far into my future instead of the events dropped at my feet. This can be exemplified by imaging yourself lost in a world of laundry with no washing machine. You see those towering dirty socks hovering over you like mountains and you take a step…. You seemed to have forgotten the filthy garments near your feet restricting your movements quite a bit. You slowly sit back up rubbing the back of your head embarrassed, and curse the pants that you slipped on. You then proceed to picking up the closest pile of clothes next to your feet and smile. 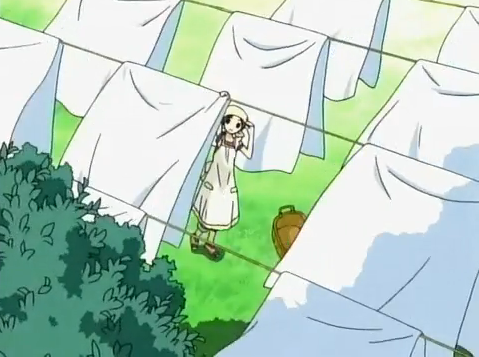 Gaping at the summit of laundry beyond you will only lead you to tripping around the scattered clothes. So though the future far away laundry is important, so is the thing in front of you – in front of your feet. I will strive look beyond those menacing piles of laundry on the horizon and sit down dealing with the stench in front of me. Though I am not very strong at doing these things right now, I hope in time I can grow and become stronger as a person. I haven’t had a blog post in a while. Somehow everyday in high school seems to be stressful and tiring; even this blog post is something I have to do for homework. Especially this week it seemed like I hardly got to talk anyone with all the tests, projects, reports, and homework to do and take. However it seems like I finally got around to posting this homework assignment up at around 3 am in the morning. Geez. I should sleep soon. But now it’s the weekends and after a tiring week I decided just to watch youtube videos and for some reason I started watching Disney. I used to love Disney and I still do. But watching Disney again after such a busy week reminded me of the love I have for Disney. I believe that Disney movies are the saddest movies out there. They also have the best villains. The villains were quick, cunning, and evil with an air of elegance to them as well. They were of course nasty. A good example is Scar. I like Scar. I have no idea why. I just do. He strikes me as someone funny and cool. My friend on the other hand hates him. Apparently she used to have nightmares about him because he was so scary. How cute. I love his song Be Prepared in Lion King. I personally thought the villain in Snow White was the scariest being I had ever seen. She was so frightening and seemed so… eerily CALM about everything she did. Watching her poison the apple with such lust was creepy. Even the part where she transforms herself into an old woman just to kill someone shows her devotion to killing her target Snow White. AND THIS WAS JUST BECAUSE SHE WASN’T PRETTY AS HER? Well, I don’t know there was another reason, but I don’t really care. She’s the most terrifying character ever. It reminded me when all I did was sit and watch Disney and TV. Even on TV I only watched Disney Channel. Disney is epic. No matter how old I get I will still continue to love Disney movies. The movies that were just fun when I was a kid seemed to take more meaning as I sat on my chair watching it today. They seemed to contain much more meanings and I never realized how good the songs were. When I was young I never used to really care for songs, in fact I thought they were just all bad. How wrong I was. Lion King’s songs were amazing and so was Hercules, and Mulan to list a few. My top five I think is 1. The Fox and the Hound, 2. Mulan, 3. Lion King, 4. Hercules, and 5. The Sword in the Stone. 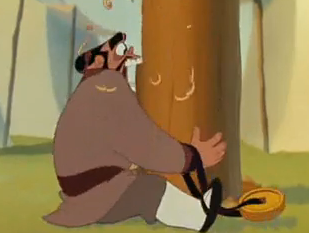 I just watched The Fox and the Hound and I swear it’s the best sad story ever. Go see it on youtube. It’s really sad but it has a somewhat happy ending like all Disney stories. It’s the tale of a fox, Tod, whose best friend is a hunting dog, Copper and as they grow up they realize that they are enemies. When I was little, I didn’t really understand the plot and the moral. 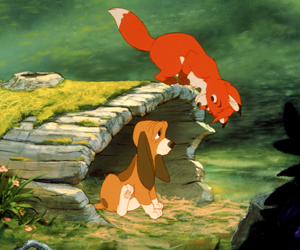 I just thought the fox and dog were cute, but now this movie struck me as being tender and sad. I used sad a lot in this blog but when I tried to find a synonym for sad I just couldn’t find one. Sad. Seems like such a deep word, or maybe because I’m just bad at vocabs. Back when I was a kid – wow I sound really old now – I used to at least watch two Disney movies everyday. Though I know the present is important, the past is something that you cannot simply forget about. I guess that does sound cheesy but I really don’t understand people who say that present is the most important thing. Present. Past. Future. Should all matter. I know as I become older I will love Disney as I do now and as I did in the past.